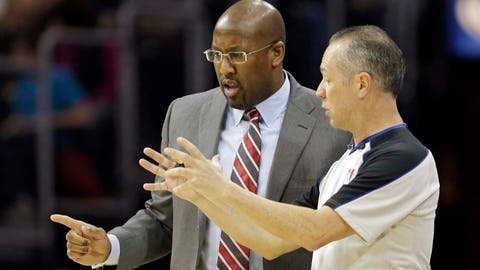 Cleveland Cavaliers coach Mike Brown (left) talks with referee Tony Brown during the first quarter on Friday, Dec. 20, 2013. CLEVELAND — Mike Brown is not pleased with the Cavaliers and you can’t blame him. The Cavs stunk it up the past two games, and we’re only being kind enough to use the word "stunk" because it’s Christmas. "Our urgency the last two games has been non-existent," Brown said after Monday’s 115-92 embarrassment vs. the Detroit Pistons at The Q. "You can live with some missed shots. The one thing we didn’t do was attack the rim. We settled. That part is disturbing." That’s not all that was disturbing. That’s not all the Cavs didn’t do. We’re getting hit in the mouth right now. We’ll see how we respond to this. "I’m not sure why we’re playing like that defensively," Brown said. "The way we’re defending, along with some of our turnovers, I have no answer for that." Prior to the Pistons game, the Cavs got spanked by the Bulls at Chicago. The night before that, they barely beat the sorry Milwaukee Bucks (in overtime) at home. All three of the teams mentioned are members of the Central Division. So are the Cavs. The Indiana Pacers are creaming just about everyone and will likely win the division. Second place is wide open, but the Cavs are playing like they’re not interested in that. Instead, they’re sort of lollygagging their way through games, looking like they’ll only have a chance if the other team decides not to show up, either. That’s no way to live in the NBA. "We have to rebound, defend and be physical, without fouling," Brown said. "We haven’t seen that for a while." The Cavs (10-17) enter Thursday’s home game against the Atlanta Hawks as one of the NBA’s chronic underachievers. Many figured a roster featuring Kyrie Irving, Dion Waiters, Tristan Thompson and Anderson Varejao (not to mention a healing Andrew Bynum) would be a lot better. TNT analyst Kenny Smith even picked the Cavs to win 55 games. Oh, speaking of the Hawks, they walloped the Cavs by a 108-89 count back on Dec. 6 in Atlanta. Irving went 0-of-9 shooting for the only scoreless game of his career. After that, the Cavs picked it up with five wins in six games and some inspirational performances. But now it’s sort of back to square one. "I’ve had people say, ‘You’ve arrived,’" Brown said. "No one is going to give you anything in this league. The mental approach is as difficult as the physical approach. We’re getting hit in the mouth right now. We’ll see how we respond to this. "If we have any pride, we’ll fight." * Not helping matters lately: The absence of Waiters. He’s missed the past three games with tendinitis in his right (shooting) wrist. But guard, who wore a brace on the wrist Monday, could return as soon as the day after Christmas. He’s second on the team in scoring at 14.9 ppg. * The Hawks (15-13) arrive in Cleveland as the third best-team in the East. So former Cavs GM Danny Ferry is doing well for himself as the man in charge of the Hawks. They are coming off an overtime loss at Miami. * Tip-off for Thursday’s game is scheduled for 7 p.m. on FOX Sports Ohio. Merry Christmas, everyone.